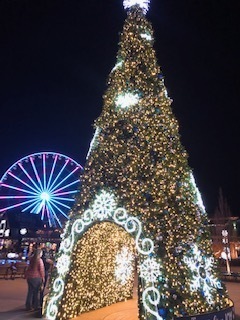 Growing up, my family & I have visited Pigeon Forge, TN nearly every year. It’s a special place near & dear to my heart and holds many memories that I’ll cherish forever. With recently getting married, I wanted to carry on that tradition with my husband. I have to say; staying at THE MARGARITAVILLE ISLAND HOTEL has started us off right! You’ve probably eaten at Margaritaville but there are also Margaritaville Hotel locations all over! This one is only about 3.5 hours from Nashville; perfect for a weekend trip! This hotel in Pigeon Forge is in the heart of THE ISLAND where you can eat, play & shop. To be honest, we barely left the island! It was our first time staying here and honestly, it was a w e s o m e.
Each room is Island Themed, spacious & has your own Margarita Machine. Also, how could I forget the spacious rain head shower with a bench?! The balcony & fireplace in our room were our favorite parts, we could have sat on the balcony all day! Our balcony faced The Wheel directly & I would say it’s one of the best views the hotel has! The Hotel also faces a river on the backside if you’re looking for a more private, quiet scene. Those views are also beautiful & listening to the river is so relaxing. The Valet was a surprise and the staff service was top notch. We were very impressed & felt very pampered! The Hotel is surrounded by nice restaurant options such as Jimmy Buffett’s Maragaritaville, Paula Deen’s Family Kitchen, Mellow Mushroom and Timberwood Grill. The Hotel itself also has options such as the Lobby Bar, Rooftop Pool & Bar and Coffee Shop that has snacks. The Hotel had live music in the lobby and the Island has a water shower the coordinates with fun music- fun for all ages! We also hit up retail & knick-knack shops, the arcade & the candy shop called Sweets at The Island. The Wheel would be perfect to see the mountains & would be a great view of the water & light show! There are also rides & a rope course. The Island is a fun family adventure in itself! After a night in cuddled up with the fireplace on, the next day we headed to ST. SOMEWHERE SPA located in the Hotel. We had never had a couple’s massage before and being the weekend before Valentine’s Day, we had to! It definitely did not disappoint. Signing in at the spa, we headed in to change into robes provided and headed to a waiting area with snacks & water. We headed into our massage & it felt like an oasis. Dimly lit with sounds of ocean waves & relaxing music, we were so excited! Our massage began with a foot soak and our massage included hot stones & oils. It was the fastest 60 minutes ever but so worth it. Afterwards, we were both greeted with drinks (you can get coffee or a mimosa) and got to hang in the lounging area for as long as you’d like. Once we left, we were ready for a nap! I highly recommend the Spa. One of my favorite things about the trip was that the Christmas decorations were still up! Seeing all of the lights and then heading to our room with the fireplace lit made my heart so happy & full. I couldn’t have been more pleased during our stay at the Margaritaville Island Hotel and I would highly recommend it to anyone visiting Pigeon Forge. It’s perfect for couples & families for a weekend getaway or a summer vacay. We felt pampered the whole stay and already can’t wait to go back! Special thank you to Chrissy & the Margaritaville Island Hotel Family! With doing so, I am a tad self-conscious about my teeth shade. Let’s be honest, unless you’ve spent tons of money on professional whitening- who doesn’t want a brighter smile? When smile brilliant reached out to me about trying their product, I was a little hesitant at first. I did not want to make my teeth sensitive (I can’t stand that feeling) as well as I wasn’t sure I would get results. After doing my research, I was on board! Did you know that the #1 dentist recommended teeth whitening method is using custom-fitted whitening trays? Guess how Smile Brilliant works? J Their trays ensure that every angle of every tooth receives even coverage of their professional strength whitening gel. Smile Brilliant trays cost 70% less (and is 5x faster) than the average U.S. dentist for the exact same service. Whoah! This kit is the Sensitive Whitening Kit and includes everything to create the molds used for your custom tray as well as the whitening syringes to use on the tray. How It Works: After answering a short dental history questionnaire, your kit ships quickly to your doorstep! Using the step-by-step instructions and the pastes provided, create your teeth molds using the molds + putty (doesn’t hurt or taste bad) and send back to Smile Brilliant with the included envelope. Once you get your custom tray (about a week later) you are set up to start whitening your smile! This whole process is super fast and very user friendly. No Sensitivity: Once you receive your final custom trays, they will perfectly fit to your teeth (but not too tight). The good thing about the trays, they are unlike strips/guards, as they fit to every tooth maximizing your results! After brushing your teeth with water only, use the syringes & apply to tray sparingly (it’ll last longer!) and get to whitening. Time recommended is between 45 minutes-3 hours. Use your best judgment based upon sensitivity, which I had none. Results: Once you’re finished, brush teeth with toothpaste and add wash/dry tray. Add in desensitizing gel and put on trays for only about 15-20 minutes. EASY! This kit runs for $149 and I’m teaming up with Smile Brilliant to GIVE ONE AWAY! Want a brighter smile? Giveaway entry: here! Special thanks to Smile Brilliant for sponsoring this post. When I turned 16, I was so excited! Driving, being able to get a job.. all that jazz. Then- 18. Whoah. I went out and got my belly button pierced because I "could." Why did I do that? Jeeze. 21 came and went in the blink of an eye and ever since then, birthday's have just felt "another year older." Nonetheless, blessed to be alive! Turning 25 almost 5 months ago has been totally different. I have changed. Change is inevitable. Change can be good or bad as we all know. I was with some girlfriends of mine recently and we were chatting about life *as always* and got on the topic of how we have all changed. Maybe you feel this way too? I honestly hate this word and hate that I've developed it. BUT- it's okay. It started around my 25th birthday. I really wasn't "interested" in going out. I was never excessive about going out, but I did like to have a good time with my friends. The loud music, the drunks, the crowds- all of that did not sound appealing. Instead, my fiance and I went out to dinner and came home to watch a movie.. it was perfect. Odd, I thought. I started feeling very stressed with wedding planning. I had let a lot of things get to me that I shouldn't have. I had LOVED wedding planning at the beginning.. then all of a sudden it felt like it was a weight on my chest. Girls should love wedding planning, right? A traumatic incident happened at my place of work. Anxiety to the max. Recently at my bachelorette trip, we had went out to a night club in Charleston. I found myself looking around to find the exits and thinking about how I would get myself and my friends out if something happened. Crazy? Prepared? I'm not sure. I could keep being specific with scenarios over the past 5 months, but you get the picture. I struggle with feeling anxious, but also questioning myself about "is this normal?" I think it's both. It's normal to stress about work, especially if you care. It's normal to stress about your wedding while trying not to be a bridezilla. It's normal to stress about crowds/bad things happening because of the world we live in. Bad things happen everyday. Even though this is "normal", it's also not okay to live in fear. I have reminded myself daily to "make the big things small, small things smaller" and to think about "controllable vs uncontrollable"
Isaiah 41:10 "Fear not; for I am with you; Be not dismayed for I am your God. I will strengthen you, I will help you. I will uphold you with my righteous right hand." I never thought I would see the day when I couldn't eat sweets everyday. My sweet tooth is large & in charge and has been my entire life. One day, I ate a cupcake and I have had trouble with sweets since. I ask myself "Why?" even say in my mind that "it's fine, it's so yummy I'm eating anyway" then hate myself later. Bummer, right? I very rarely get sick. I just got over the flu.... at the age of 25.... in July. WHAT? I never have struggled with skin issues (thankful) but age has changed that. Take care of your body. Make time for yourself. I have learned that this has to be a priority. I used to be able to say I had a lot of friends. Now, my circle is pretty small. I have felt relationships drift away these past few months and had to ask myself some questions. How does this person make me feel? When we talk, what do we talk about? How am I benefiting from this relationship? If the answers aren't positive- cut them out. If you were to tell me that certain people wouldn't be at my wedding 3 years ago, I would think you were crazy. Things happen & people drift apart- it's normal. Life is way too short to be negative. Attitudes are so contagious; why not surround yourself with positive and supportive people who brighten your day? I also questioned myself- am I a good friend? Maybe it's me? Relationships are a two-way street. I learned to invest in the relationships that matter and don't stress about the ones who don't. Learning more about yourself can be scary, but a good thing. I've learned that I like a lot of foods that I didn't think I liked (asparagus, broccoli, etc. ), I am prepared (mentally & physically) if something bad happens where I am, and I have all of the people in my life I need- all thanks to the Good Lord. I hope you enjoyed honest & real post! It's that time of year where every blogger is talking non-stop about this "magical sale that you HAVE to shop at".. The Nordtsrom Sale. I almost dread it. I find myself skipping through InstaStories that mention it. The good thing about this sale is that all of the products are N E W for fall! Different brands from Nordstrom (B.P, Freepeople, Madewell, etc.) put things on sale up to 50% off! The downfall is, the same products will be re-stocked throughout the season so you may see a lot of the same pieces. This is why it's good to stick with BASICS that you can layer and create different looks with! Links listed from Left to Right! NEXT: PJ's- my fav! These were too cute not to share and would make great Christmas gifts! (it's never too early to shop!) I LOVED the white night shirt- how cute for bride to be's? These are also under $50 and links are listed Left to Right! LAST: Makeup Steals! Some of these deals are insane and are selling out super fast! Here are my fav's under $50! Links are from Left to Right! I'm all about sharing tips and tricks to stay on trend and on budget! I hope you find some things you like! Athleisure is such a trend right now. Plus, every girl loves Yoga. Being comfy, practical and fashionable while working out- yes, please! I’m joining the FABLETICS team with Demi Lavato and Kate Hudson to showcase some fab looks! Looking for a yoga studio? Try out COREPOWER YOGA! Fabletics + CorePower Yoga- sign this girl up! The High-Waisted Printed Powerhold 7/8 Leggings are perfect for spring. The floral pattern is so fun and motivating to wear to yoga! The high waist results for more of a comfy, practical feel. The Emmeline Leggings make me feel like cat woman with the mesh cutouts! Plus- black is so flattering and versatile, who wouldn’t feel the same way? They offer super cute outfits that are easy to mix & match and have such a variety of their leggings. High waist, cropped, cut-outs; you name it! Not to mention their awesome customer perks. Get 2 for $24 leggings ($99 value) when you use MY LINK! Other VIP perks include discounts with other brands, free shipping & free workout videos! I’ve been active ever since I was a kid. Soccer, cheer, basketball, dance- I’ve tried it all! I have been looking for something lately that I would look forward to going to (we all know the struggle) and I HAVE FOUND IT! CORE POWERYOGA is an intensely physical workout rooted in the mindfulness of yoga. Turning stress into sweat and doubt into security- you’re in for a treat. They have 180 studios nationwide and memberships are transferable to studios, which is great for traveling to keep a consistent routine! Their studios have a very inviting atmosphere and the staff is unbelievably nice. Not to mention the great accommodations and spacious studios with great lighting. For my Nashville friends, I go to their Brentwood location and they are also opening a Green Hills location in June! With classes starting at 5:30am and staying open late, there are plenty of classes to suit everyone’s needs/experience levels. I have attended 2 different types of classes that I really enjoy. Need some “me” time? This one’s for you. Listening to inspiring sounds (wind chimes and sounds of the wind), this class works every muscle through movement and breath. Exploring the postures and principles of Vinyasa yoga in this class is so calming yet rewarding. There is no heat added in this class, but you’ll still sweat it out! All photos by SOUTHWELL PHOTOGRAPHY! Love yourself, love your bodies. Spring is almost upon us.. can you tell I'm excited? Cool mornings, warm afternoons & cold nights; in Tennessee at least. I grabbed this comfy cut-out sweater from BLUSH and it’s a great staple piece. It has a slit on the front around the shoulder and has a low back- perfect with a bralette! Spring is all about transition… out with the bulky layers and in with pastel floral. This year I’m super excited for jumpsuits, shorts & one pieces! What are you most excited for? Are you looking for invites that you can make your own? Invites that you can customize and be different than everyone else’s? Have no fear, Basic Invite is here! Basic Invite is located in Saint George, Utah and have been creating the perfect card for every event since 2006. They truly are the custom color company! Basic Invite is unlike most websites. Their website allows you to create a design with an instant preview. With almost unlimited colors (180 different color options- who even knew there were 180 colors?!) you can make sure the card/invite is EXACTLY how you want it! They also just rolled out their new collections of clear, rose gold and foil. Being able to customize wedding invitations and add in every detail desired is what really makes Basic Invite stand out among other stationery companies online. Once designing your invite, Basic Invite also allows customers to order a printed sample of your actual invitation so you can see the final product before ordering! Once you’ve designed your custom invites personalized & signed off on the sample, you can keep the personalization going with envelopes! Make your invite stand out before it is even opened by selecting from 40 different color options. If you use Basic Invite’s free address collection service, you will receive free envelope printing. How awesome?! With over 800 wedding invite sets, you can find everything from save the dates to wedding invitations and wedding menus to thank you cards! They have it all, ya’ll! Basic Invite offers much more as well. Grab a perfectly personalized wedding guest book for your big day. These customizable books have a ring hidden, which allows them to lay flat making it convenient for your guests to easily leave sweet words and well wishes! They also have free wedding website (yesssss) that are just as customizable as everything else. You can upload all of your wedding details and images to a mobile friendly and easy to use website for everyone to use. Choose from 180 custom colors or even choose a design to match your wedding invitation suite! Your big day should be everything you’ve dreamed of. Why not make every detail the way you want it? See more inspiration on Basic Invite’s Instagram or check out some more of my own designs! Thanks to Basic Invite for sponsoring this post! Finding your Frock should be Fabulous! Wedding dress shopping… something every girl dreams of. When I was little, I used to think about this day often. I would dress my dolls in wedding gowns and think “that will be me one day.” My experience with Fabulous Frocks was everything I dreamed of and more! With a long engagement, I did my research before going shopping. I searched for bridal boutiques with reviews on The Knot and came across Fabulous Frocks! They have a 5 star rating on The Knot and on Wedding Wire. I took a look around their website and realized Fabulous Frocks was located in Franklin, TN which is just south of Nashville! Fabulous Frocks is by appointment only, which puts an emphasis on their focus of giving each bride a personal, and relaxing shopping experience. They have the largest selection of designer gowns in the city including a variety of gowns from traditional to boho- something for every bride! Fabulous Frocks offers gowns that can be purchased directly off the rack (at a discount & taken home that day!) as well as made to order designer gowns. They also offer accessories such as veils and sash belts. When scheduling my appointment, Amy the owner, chatted with me about what style of dress I had in mind. I had, of course, been searching Pinterest for years looking at wedding dresses. I admired Lillian West gowns as well as Hayley Paige- intricate details is what I like! She also asked who would be joining me that day & had me super excited! Upon arrival, I loved how appealing the shop is. It’s easy to locate and has a relaxing, inviting atmosphere with great lighting and comfy seating for your girls. The fitting room is huge (yay!) and they have 3 huge racks of dresses to look at. I went into this appointment completely open minded but truly hoping I would find the one! One hour later, I was walking out the door with my wedding dress! Funny story, my fiancé hates surprises. He was asking questions as soon as I came home from my appointment about what the dress looked like. I was joking with my mom, friends & mother-in-law about how I shouldn’t have any pictures on my phone of my dress because he would try to look at it! Haha.. only 239 more days! My shopping day was how every bride to be's day should be- easy & fun. If you’re looking for a wedding dress, call Amy & schedule an appointment! I am (in)patiently waiting for our big day so I can wear my dress and say I DO to my best friend! Thanks to Amy and Lanae at Fabulous Frocks of Nashville for making this experience so easy and perfect. Remember when we were younger & had "valentine's parties" in elementary school? Those were the days when our biggest decision on V-day was deciding on what valentine's we were going to pass out. Now, it's "what to wear", "what to buy", etc. Whether you're celebrating with your significant other or with your galentine's, I've got ya covered! First off, this dress from THE MINT JULEP BOUTIQUE is perfect for Valentine's Day! I've talked about this boutique over & over but that's because they are the real deal. Trendy, comfortable & affordable pieces- yes, please! The SHINE FOR ME DRESS has a halter neckline to easily accessorize plus it is super flattering. It's the perfect shade of Wine, has great textured fabric & is only $43 bucks. YAS! I paired my fav CHEETAH BOOTIES & KATE SPADE EARRINGS with this dress. Pair it with a light jacket for a night out & you're sure to be a big hit! When you think of Valentine’s Day, 2 things come to mind; chocolate & flowers. This year, show how much you really love your person (or yourself) with not just your ordinary flowers. OSHI FLORAL DESIGN has a very unique style of their original floral compositions. This Valentine’s bouquet left me speechless & drooling. It’s beautiful and truly a step above the usual. OSHI also offers Corporate and Residential Installations, Wedding Services, Corporate Events and Holiday Décor. They are located in a large studio in the heart of downtown Nashville + you can order online for local & worldwide delivery! Carrie Underwood, Brad Pitt & Tim Gunn all agree that OSHI is the best! Special thanks to THE MINT JULEP BOUTIQUE and OSHI FLORAL DESIGN NASHVILLE for sponsoring this post. All photos by SOUTHWELL PHOTOGRAPHY! A simple & cute way to ask your bridal party to stand by you on your big day! Bridal party: CHECK! I had such a fun time gathering ideas to ask my bridesmaids to stand by me on my big day. It was easy, simple & budget friendly PLUS they loved it, so I thought I would share! When choosing my bridal party, I went with my 3 best friends! Friends whom I’ve grew up with, lived with & experienced life with! I also asked my 2 cousins to stand by my side as well. They’ll never know how much they mean to me! Some advice…this is your day. Ask who you truly want to be with you; no obligations. No need to go “all out” & blow your wallet by asking them either. They will love anything! Here is what I did.. everything (or something similar) is linked below! EASY PEASY! From here, I personalized their gifts by writing their names on the gift boxes with a chalk pen as well as making the inside of the cards special! Those were made with a cricut! This gift was easy, affordable & a big hit with my girls.